Living in Texas, you know how important it is to have ceiling fans in your home. 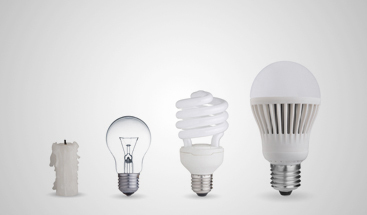 If you’re building a new house, or you want to update your fans, it’s important to find the right size for each room. Some rooms in your home will need large fans, while others can get by with smaller fans. The square footage of the room and the height of the ceiling will be the two most important factors when determining which fan size is appropriate. 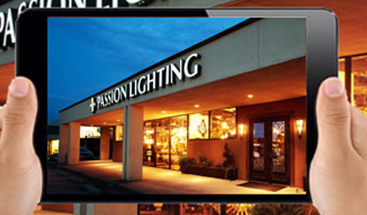 At Passion Lighting in Grapevine, we can help you choose the model, blades, and controls for your new ceiling fans! Once you know the square footage of a room, you can begin looking at fan sizes that fit the space. For rooms that are less than 75 square feet, a blade span of 29 to 36 inches should suffice. You can find the blade span of a certain fan by measuring the distance between opposing blades on a fan with an even number of blades. For fans with an odd number of blades, measure the distance from the center of the fan to the tip of the blade, then multiply that number by two. 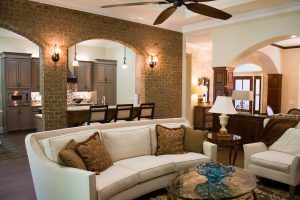 Larger spaces, such as your living room or family room that may be anywhere from 200 to 400 square feet should have a fan with a blade span of 50 to 72 inches. Spaces larger than 400 square feet may need two ceiling fans to be adequately cooled during warmer weather. 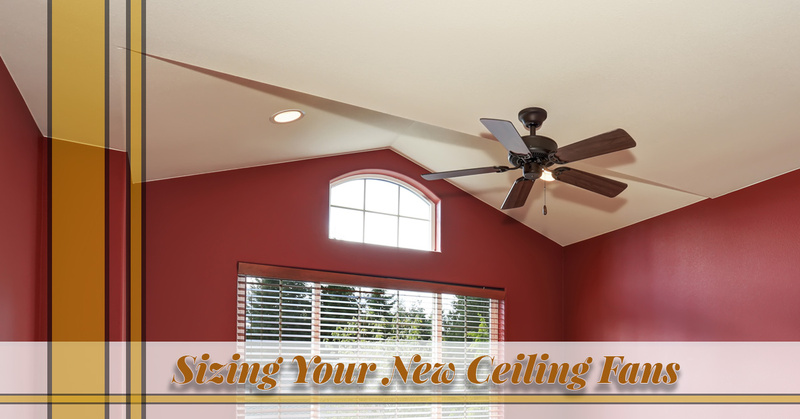 The next most important factor when choosing a fan is the height of the ceiling. Low ceilings, such as those that are eight feet, will require a low profile fan that’s almost flush to the ceiling. You’ll want to also be sure there’s at least 18 inches minimum between the end of the blade and the wall, and seven feet from the bottom of the fan to the floor. You don’t want tall people having to duck every time they walk in the room! 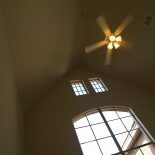 For higher ceilings, such as those between nine and 13 feet, the fan can be mounted with a downrod. You’ll still want to maintain the distance between the wall and floor, and our staff can help you choose the appropriate downrod. 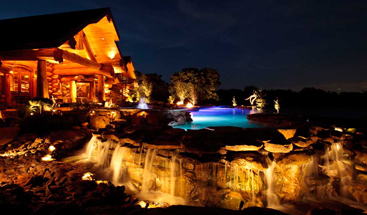 For sloped ceilings, we can recommend the best fan model, blade size, and downrod. Once you’ve determined what size of fan you need and where it needs to be placed in the room, you may have questions about installation. You may be able to handle it yourself, but if not, we offer full fan installation and blade replacement services. Our professionals can properly mount your new fan in the perfect spot and ensure that it’s running properly. We want you and your family to be cool and comfortable, not worried that the fan is going to fall from the ceiling! If you’re shopping for ceiling fans in Dallas/Fort Worth, contact us today or stop by our showroom to view the best options. We look forward to helping you!